Inspired by Shirley Goode’s Jammy Dodgers, we like to also make a Nutella (or other good nutty spread) version. Line two trays with grease proof paper. Pre heat oven to Gas Mark 4 (180 c). Cream together the butter and sugar until soft and fluffy. Add both the plain and semolina flour and beat into the creamed mixture. Gradually add water until the mixture comes together in a dough. If too dry add water and if too wet add more flour. Gather together to make a ball of soft dough. Roll out on a lightly floured surface to about 5mm thick. Using a shaped biscuit (cookie) cutter (I used a heart shape) and begin cookie shapes out of the dough. Keep re-rolling the dough until you have made as many hear shapes as possible. Keep four whole hearts to be the bottom layer. Keep the small off cuts to make small snack biscuits. Place on the tray and put in the fridge for 20 minutes to firm up the dough (I admit that we skip this step when we have hungry kids waiting for biscuits). Bake for 12- 15 minutes until pale gold in colour. When cold, spread the complete shapes with Nutella- leaving a border around the edge. Cover with the hearts with the holes in centre and press together. Decorate with chopped nuts if desired. You have made home made Nutella (not Jammy) Dodgers! These will keep for up to a week in an air-tight container. Enjoy! 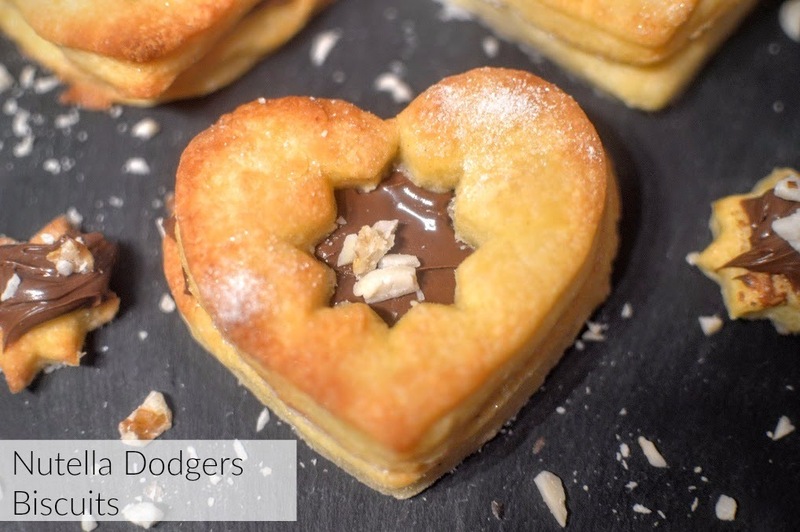 What filling would you like to see in “not jammy” Dodgers?